The Gary Sugal DL (Dave Liebman) Hematite duck bill soprano mouthpiece is not much larger than a penny and packs a million dollar sound. This model, because of it’s obvious size is regarded by some as a precision machined work of art. Manufactured in house on Sugal’s CNC (Computer Numerical Control), it is the perfect mouthpiece for the traditional, post bob player, aspiring to the great sound of Dave Liebman and Steve Lacy. This duck bill design allows the mouthpiece to be free blowing. What players will notice immediately is that it has a rich, powerful, centered sound with an added slight edge. The DL mouthpiece is one of the most technologically advanced metal soprano saxophone mouthpieces ever made. It was designed for Dave Liebman in 1991 and is featured on dozens of his albums recorded over the years. It features Sugal’s precision machined parallel Mini Tracks™ which focuses the air flow, economically into the chamber, allowing the metal to breathe or expand for maximum resonation. Traditional players will experience a whole new freshness with regard to embouchure comfort and sound production. This model features a medium chamber and medium baffle allowing for a solid full bodied centered sound and is reminiscent of the Liebman/Lacey soprano sound. Designed by Gary Sugal and Dave Liebman, this model is finished in durable heavy duty proprietary black hematite plate and is ideal for the aspiring jazz musician. The Dave Liebman Duck Bill Black Hematite SOPRANO was designed for Dave Liebman back in 1991. It has a full bodied contemporary dynamic sound every aspiring jazz musician seeks. It’s emulates the great sound of Dave Liebman and Steve Lacey. Dave Liebman Duck Bill Black Hematite SOPRANO is never disappointing and is there when you need that little something extra. It cuts through competing electronic instruments. 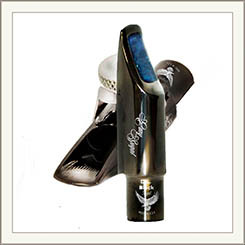 The DL Duck Bill soprano mouthpiece can be used in a trio or quartet environment. Most noticeably it embraces the embouchure and is very comfortable in the mouth. It is a delight to work with during those long practice sessions. The Dave Liebman Duck Bill Black Hematite SOPRANO features laser treated side and tip rails as well as evenly laser treated body. The table on the Duck Bill is laser swept flat, so that your reed will respond to those critical measurements Sugal incorporates into every facing of his mouthpieces. All of Sugal’s models feature parallel re-fined “min-tracks” that can be found under the bite plate and inside the chamber.